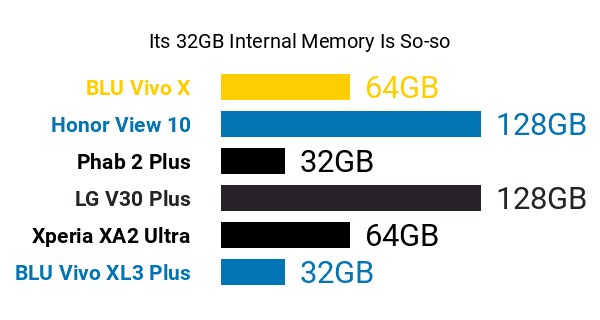 The BLU Vivo XL3 Plus, though an enlarged version of the XL3 that shoots for a spot among the best phablets on the market, remains within mid-range smartphone bounds when it comes to technical pros and cons. For starters, it is humbly powered by a 1.4GHz quad-core Qualcomm Snapdragon 425 processor , despite the fact that most similarly-sized models run on eight-core engines -- check out some of the best eight-core smartphones here. Its substantial (for a mid-range smartphone) 3GB RAM contrasts its processing chip nicely, though. Its RAM count also makes it more ready for heavy multitasking than a lot of other mid-range models -- the ones with no more than 2GB of RAM to work with, that is. In addition to having a low-caliber CPU, we also found its 64GB external memory ceiling quite odd, knowing that many mid-enders with tantamount screen real estates support up to 128GB microSD cards -- it comes with 32GB of native storage. Up front, the XL3 Plus touts a large 6-inch screen with an end-to-end concept . It combines an 18:9 aspect ratio, a 450nit maximum brightness, and 2mm-narrow bezels . Sadly, its large facade is not all about pros, since its 1440 x 720 HD+ display is definitely a con, coming from a phablet of its size. 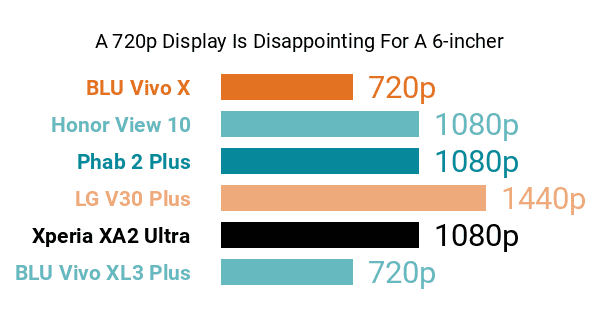 Imaging-wise, the Vivo XL3 Plus features a typical (as of this review) 13-megapixel main camera equipped with phase-detection autofocus (PDAF), likely holding its own ground versus the rear cams of many competing 2018 middle-class Androids. More-interestingly, though, this XL3 variant boasts a 16-megapixel 5P-lens camera aided by a dedicated front-firing LED flash , an upgrade over the plain XL3's 13-megapixel selfie shooter that gives this Plus version a higher chance of rubbing shoulders with the best selfie smartphones out there. Joining its forenamed hardware pros and cons under the hood is a 3000mAh battery that scores an encouraging 30-hour (1800 minutes) talk time , yet promises only up to 7 days (168 hours) of standby time -- the average standby time when it came out was roughly 330 hours. The Vivo XL3's security specs are led by a rear-mounted fingerprint reader combined with an encrypted file management system , while its exterior is composed of an aluminum backing and a curved glass touch panel. Curiously, this Plus edition is only offered in Midnight Black , whereas its base model comes in Gold and Silver shiny-metal finishes. 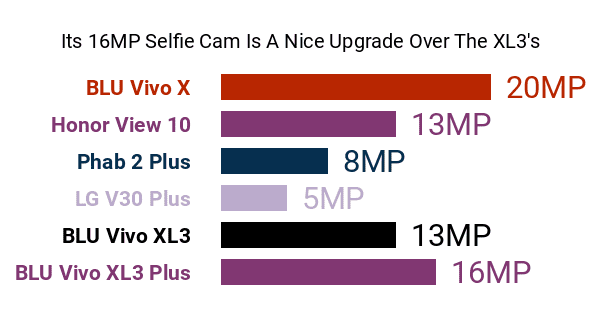 Nevertheless, the Vivo XL3 Plus sounds like a solid choice for mid-level smartphone shoppers who are looking for a wide-screen Android rigged with an above-average (in this class) selfie camera.